Kicking goals is an understatement. From 3x womens world champion to winning the Open class at a race on the world circuit. Emily Pross set history this past week in the Philippines. The first time I saw Emily skate was at I Love Downhill 2013 in Windham, NY. I remember seeing her skate into crash corner, falling, getting up, assessing the line, and doing it all over again. From this moment to seeing her face after she crossed the finish line and beat two world champions was astounding. Max Vickers: How are you feeling right now? Emily Pross: Honestly I don’t know how to feel. I set this goal a while ago, but I saw it as unrealistic. I never thought all the hard work I put in would pay off. I guess, unrealistic goals lead to unrealistic outcomes if you're willing to work for it. MV: What does this win mean for women? EP: For women I want this win to be a means of inspiration. I want then to know that there is a place for them in downhill. And being as fast as the boys is achievable. But more importantly, not just for women, but for everyone, no matter who they identify as, you truly can do anything you put your mind on. 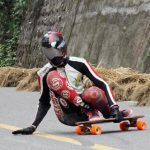 MV: By winning this race, do you think this will create a movement in getting more women involved in downhill and extreme sports in general? EP: I hope so. I don’t want this to just inspire women in extreme sports, but rather all sports. I want to see women competing with or against the men in major sports leagues. That is something I would love to see. 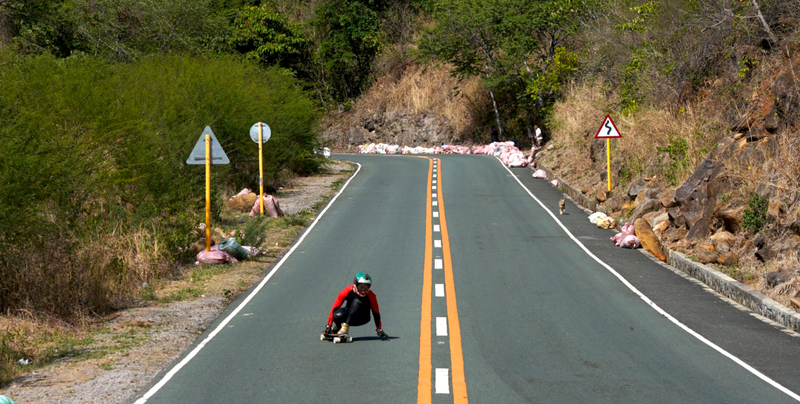 But I feel, the barrier of entry into these sports is not as easy as downhill. So I’ve truly been blessed to have the backing of the IDF and the organizers in letting me race womens as well as open. MV: What is your biggest challenge in competing in a male dominated sport? EP: The biggest challenge is that when I accomplish something and feel good and confident about that accomplishment the men are very quick to discredit my accomplishments. For example, last year when I was NorAm Open Champion. Another rider messaged me literally telling me the only reason why I was Champion was because they failed to attend one of the races in North America. And that wasn’t the only instance of something like this happening. It is things like this that really hurt me. At the same time though, people like this don’t realize they are fueling my motivation even more because I strive to prove these people wrong. I’m probably one of the few hardest working downhill skaters in the industry right now due to my drive to prove these people wrong. You learn real quickly which guys want to support you and help you succeed in this sport. I’ve also been lucky to have a small group of people go above and beyond and help me learn. MV: Being such an inspiring figure, how do you think you can further connect with the female community? EP: I’m not really sure. I don’t totally agree with the feminist movement. But I don’t think its about totally connecting with women. I think it’s more about connecting with both men and women. By showing women you can do anything no matter how male dominated a sport can be but also by showing men that it does not hurt your masculinity if you get beat by a woman in sports. The stereotype exists where men think they are weak if they get beaten by women. Which discourages women to go above and beyond in anything male dominated, because once a man sees a woman doing better than them they want to shut them out. My main goal is to destroy this stereotype. MV: Not everyone is surrounded by a community of skaters and as a female it can sometimes be hard to become intertwined in communities. How can female riders join or build skate communities around them? EP: The Longboard Girls Crew is a great way to connect with other female skaters. However, at the same time when I first joined the downhill community I actually received more negativity from other women and unfortunately some of those women were skater I used to look up to. I think one way the female skate community can be more intertwined is through having more camaraderie among other skaters across many different skating disciplines. MV: What does a normal week look like when you’re not at an event? Are you skating every day? EP: A normal week is never dull for me. I mostly work full time for my Uncle’s Construction business, “Pross Construction” working in electrical substations in order fuel the funds for the race season. I’m a full time online student as well, and on top of that, I go to the gym after work and manage to get a full workout. If I’m lucky I maybe get a small skate session on the weekends if the weather holds up and someone is willing to shuttle me for a few hours in the hills. Generally I don’t get as much skating in as I want to and it’s mostly visualization and watching skate videos that helps my skating. MV: What was going through your head at the start line of the finals at Seaside? EP: Nothing was going through my head on the start line. In fact I felt very relaxed as compared to the couple other times I was in an open final. MV: Do you see yourself being Open world champion this season? EP: One step at time. I would like to be and I think that would be great! But again, one step at a time. I still need to make podium in a World Cup. MV: What are your 3 year and 5 year goals? EP: In terms of skating, I want to keep improving. I would like to podium in an Open World Cup, win an Open World Cup Race, and make Top 5 Open world Rankings. In terms of secular goals, graduating college is certainly not to far on the horizon. I would like to own my business too but have not decided whether to start a skate related business or pursue fitness and maybe open up my own gym.